The Minneapolis Park and Recreation Board is holding a public “focus session” on Dakota and indigenous peoples history around Lake Hiawatha on Wednesday, Jan. 9, 6-8 p.m. at the Hiawatha Recreation Center, 2701 E 44th St. The event is free and open to the public. This is part of ongoing community conversations around the Hiawatha Golf Course Master Plan and the area’s redevelopment. The evening will include opportunities to learn Dakota language, philosophy and culture, as well as try out a “water bar” featuring different flights of water. 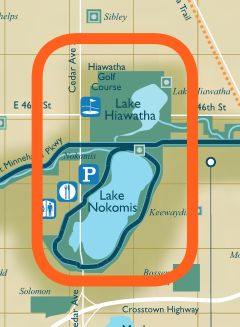 Area covered by the Hiawatha Nokomis Master Plan. The Park Board voted in 2017 to close the Hiawatha Golf Course to reduce the need to constantly pump out groundwater, according to an article in the Star Tribune. Next Wednesday’s focus session is the fifth in a series of community conversations around future plans for the area. The Park Board held four focus sessions in November to listen to concerns and interests relating to the Hiawatha Golf Course Property: African American History at Minneapolis Golf Courses, Environmental Issues, Golf, and Neighbors. The Park Board’s Nokomis Hiawatha Regional Park Master Plan, adopted in 2015 setting out a 25-year vision. It is still being revised. Updates on the Master Plan. Form to submit community comments. While not explicitly in the Master Plan, it seems there should be an opportunity to include interpretation of Dakota history, culture, and ongoing presence in the area as part of any redevelopment.